If you are going to spend time on a project you might as well use the best zipper components available, YKK zipper. Sold Per Each. Duties and VAT Included. Metal slider with single pull for #5 Coil YKK® Zipper. The pull-tab does not lock at any position on the body. Non-locking mechanism. Use with or to repair a #5 Coil YKK® Zipper-by-the-Meter zipper. Note that zipper sliders from different manufacturers are generally not interchangeable. Metal slider with single pull for #8 Coil YKK® Zipper. The pull-tab does not lock at any position on the body. Non-locking mechanism. Use with or to repair a #8 Coil YKK® Zipper-by-the-Meter zipper. Auto-locking slider. 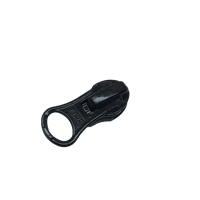 Use with the Water Resistant #5 Coil Zipper, item ZBY-YKKU5WP-Black. This slider does not work well on standard #5 coil zipper if you put it on with the tab on the coil side. It works ok if you put the tab on the backside as shown in the photo. Auto-locking slider. 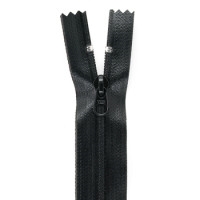 Use with the Water Resistant #8 Coil Zipper, item ZBY-C8WP-YKK-Black. This slider does not work well on standard #8 coil zipper if you put it on with the tab on the coil side. It works ok if you put the tab on the backside as shown in the photo. Metal slider with single pull for #8 Molded Tooth YKK® Zipper. The pull-tab does not lock at any position on the body. Non-locking mechanism. Use with or to repair a #8 Molded Tooth YKK® Zipper-by-the-Meter zipper, ZBY-M8. Metal slider with single pull for #10 Coil YKK® Zipper. The pull-tab does not lock at any position on the body. Non-locking mechanism. Use with or to repair a #10 Coil YKK® Zipper-by-the-Meter zipper. A coil zipper is made of spiral nylon elements. This is the most popular zipper type. This versatile zipper can be used in anything from apparel garments to luggage or sporting goods to automobiles. This zipper chain is sold by the yard allowing you to make any length of a non-separating zipper you would like. A non-separating zipper is one where either one or both ends of the zipper stays fixed together. A pant fly or a bag zipper are examples. You may use a zipper stop on the closed end of the zipper or simply sew across the chain. A separating zipper comes apart on both ends and a jacket is an example of that type of zipper. This zipper chain also comes on a 200 m (219 yd) roll. Note that if you order more than 200 m, you will get your chain in multiple lengths. This zipper chain also comes on a 150 m (164 yd) roll. Note that if you order more than 150m, you will get your chain in multiple lengths. This is genuine YKK® zipper chain. This is a molded tooth zipper chain and requires a molded tooth zipper slider, PU-M8-Coyote Brown or PU-M8-Black. Zipper chain shown with slider, sold separately. YKK's UV VISLON® MARINE MATES® zipper is designed to resist damage from sunlight and corrosion. It withstands ultra-violet rays better than YKK's standard VISLON® zipper. This zipper chain also comes on a 125 m (137 yd) roll. Note that if you order more than 125 m, you will get your chain in multiple lengths. This zipper chain also comes on a 100 m (109 yd) roll. Note that if you order more than 100m, you will get your chain in multiple lengths. Official MultiCam® #9 coil zipper by the yard. Use to make non-separating zipper to custom length. Heavy molded tooth separatng zipper, 41 cm (16 inch), in length. Comes completely apart. YKK® colors Black, Olive Drab, Coyote Brown and Tan 499, the preferred color to match MultiCam. #10 molded tooth is a heavy zipper. Use for outdoor jackets and coats. Heavy molded tooth separatng zipper, 66 cm (26 inch), in length. Comes completely apart. YKK® colors Coyote Brown and Tan 499, the preferred color to match MultiCam. #10 molded tooth is a heavy zipper. Use for outdoor jackets and coats. This is a weather resistant AQUAGUARD® coil zipper sold by the meter. It is a water repellent zipper with the back side of coil zipper is laminated with polyurethane (PU) film. Shiny and matte polyurethane coating on the reversed coil zipper enhance the appearance of your garments. The zipper can be RF welded or ultrasonically bonded or sewn. This item is heat durability, washing durability, and is good at operation at low temperatures. Often used on bags, backpacks, cases, bike bags and, horse and dog panniers. All sorts of outdoor and marine gear. Use with one or two #5 coil sliders, PU-U5WPL-Black. Note that the zipper slider is flopped over from the traditional #5 coil slider and that standard slider will not work properly with this zipper chain. #5 Coil separating zipper, 66 cm (26 inch), in length. Comes completely apart. Use for jackets or covers that have to come completely apart. Use with one or two #8 coil sliders, PU-C8WP-Black. Note that the zipper slider is flopped over from the traditional #8 coil slider and that standard slider will not work properly with this zipper chain.